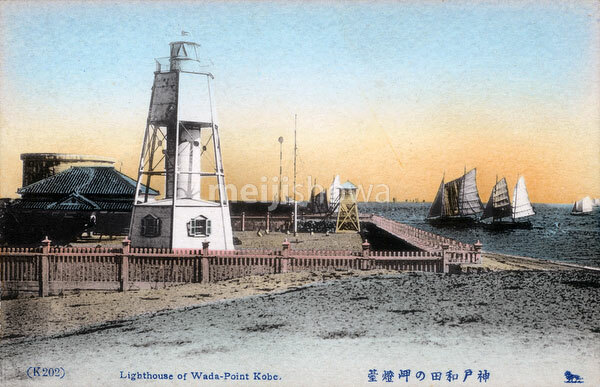 The lighthouse at Wadamisaki (和田岬灯台) in Kobe, Hyogo Prefecture was activated in 1884 (Meiji 17). It replaced an earlier wooden structure dating from 1871 (Meiji 4), designed by the Scottish engineer Richard Henry Brunton (1841–1901), the “Father of Japanese lighthouses” (日本の灯台の父). Wadamisaki Lighthouse was relocated as a historic monument to Suma Seaside Park (須磨海浜公園) in 1964 (Showa 39) and still stands today.